We are coming up on the end of the school year where kids are excited that they are going to be moving up to the next grade level, but not our son. 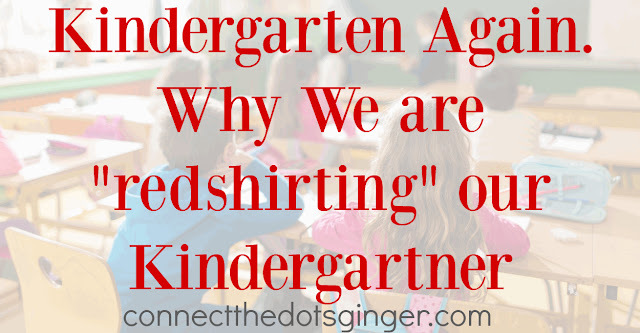 We are "redshirting" him. We knew pretty early on in the school year that Mason was struggling with keeping up in his class. He does have a July birthday, so he was one of the youngest kids in his class. But with the cutoff of the year Sept 30 in our area. We thought that he was going to be fine. The idea of holding him back next year came up in September. SEPTEMBER. I was actually kind of mad that the teacher was saying it so early on in the school year, but she knew. She knew that he would be struggling to keep up. "What did I do wrong?" was the main thing I kept asking myself. "What more could I have done?" Nothing. We did everything right. There were other things that were holding him back. Mason had a huge speech delay compared to the other kids. 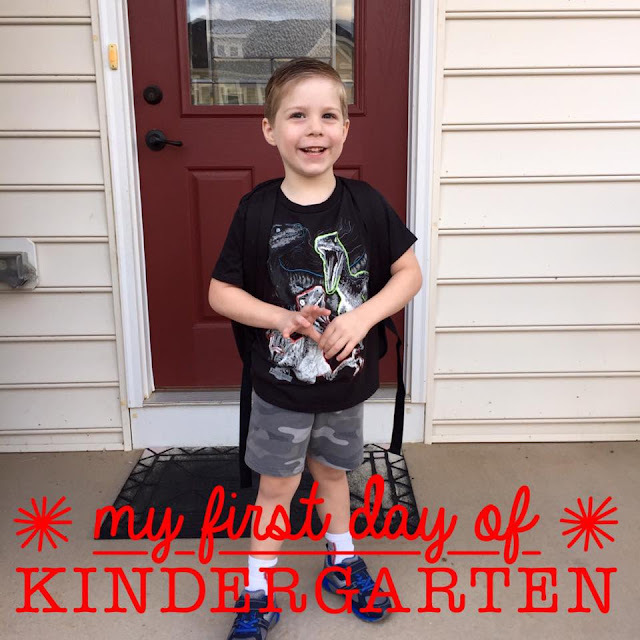 We had started him in speech therapy at the beginning of 2016 while he was still in preschool. And when he started Kindergarten, he didn't know most of the letters. We didn't know that. I thought he knew more. The main reason was because he couldn't physically say them, so he didn't learn them. He would memorize them short term but ask him the next day what the letter was he had no idea. That was our biggest delay. So right after that first meeting in September with his teacher I was writing letters on his snack bag and going over it every morning with him and we worked hard! Little dude was finally making progress. One thing that I want to get clear is that he progressed this year. Made a HUGE progress. And both times he was officially tested for meeting the benchmarks required he was at the same learning curve. He was only 90% there. He just needed 10% more to meet the benchmarks, which is HUGE. And honestly, we had to request for him to be held back because he is right on the border. He could go on to first grade as normal next year but he wouldn't thrive. He would struggle. And we would struggle right along with him. For us, it was the nightly struggle. Getting him to write was tear inducing. Getting him to read was full of negativity and crying and yelling and frustration. We didn't even have time or the energy to go over numbers and counting with him. We were trying to over teach him from what the teachers wanted. So we were pushing him a lot harder than what was to be expected. He is in kindergarten for pete's sake. We worked hard with his teacher for us to learn how to help him best. Work with your child's teacher. Learn from them. Have extra parent teach conferences. Ask questions via email. Be the annoying parent because it is your right. I felt bad in the beginning about being annoying but this was my kid's education and future. So I annoyed his teacher I am sure. But he made HUGE progress by the end of the year. Use the resources that your school offers. Mason is in speech therapy, he was tested for occupational therapy. He is in the PALS resource to help him with reading and letter recognition and works with the teacher helper a lot. Don't be ashamed of the resources that your school does offer. That is just one more thing helping your kids excel. I'm sad that he won't be in the PALS program next year as he really does enjoy it and has learned so much from it. But it will be there for the kids that do need it just like he did. Make learning as fun as you can with your child. You read above that most things were tear inducing or would easily frustrate Mason. We made it a point to read dinosaur books with him. Or super hero books. We found books that he wanted to read. We still struggled with them and getting him to follow along and focus but he enjoyed them. CELEBRATE the little things. Any time Mason read something by himself, I would cheer and scream out of excitement and the he would give me the biggest grin. Writing his full name for the first time without him crying out of frustration, I was crying for happiness. He saw that and loved it. He is huge for positive reinforcement. We focus more on the good than bad now. If he gets frustrated we try to turn whatever is frustrating him from a negative to a positive. Doesn't work every time but we really do work hard at it. What age they will be when they graduate- Mason will be almost 19. What age they will be when they start to drive- He will be 16 as a freshman! SCARY! This decision will impact when he goes on his church mission. When he starts college. When he graduates college. He is going to be the older and bigger kid at school now. We are hoping that that gives him the confidence to not be a follower and follow kids for attention but that he is the leader and making better choices. Also this is why he is now in karate, to learn to be a good leader and focus. To "redshirt" your child really does impact the rest of their life so be prepared for that. But on the flip side, Mason will have a stronger foundation in school because he will have more confidence and ability to keep up. For us, the positive aspects we are looking forward to are far greater than forcing him to move up and try to keep up with everyone else. Mason was fully aware of our decision and he also agreed that he wanted to get better at knowing his letters, numbers and writing before he moved on. He knows that first grade will be just a little too hard for him. Communicate with your child. Let them know. But I will say, yesterday, he was upset when we talked about it. He asked me "why is everyone else moving up but me?" We had to talk about it all over again and he again decided that he just wasn't ready for 1st grade. But yesterday was heartbreaking for me. I don't like making him upset or knowing he is upset because of a decision that we all made for him with his input. In the end, you have to decide what is best for your child. Where they are going to thrive the most. It isn't a negative thing to hold your child back. At least it shouldn't be. I would rather hold him back in Kindergarten then at an older age where it truly will be more difficult and socially difficult for my child.